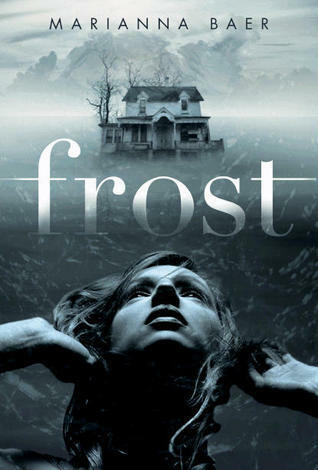 I stayed up way too late reading Marianna Baer's debut novel, Frost. Each chapter kept building a feeling of uneasiness until my eyes were stinging and I couldn't fight sleep anymore. It was worth it, though, as I will be thinking about Frost for a long time. Leena's senior year was supposed to be perfect: she and her friends were awarded the small Frost House as part of their campus lottery, she is a leader of a student mentorship program, she is planning to apply to top colleges. But then Celeste Lazar was placed in Frost House and things start to go wrong. She may have a cute brother, but Celeste is strange and begins causing rifts between Leena and her friends. Then, things get even worse and Leena and the reader don't know what's happening...is Frost House haunted? Is Celeste's brother a darker character than he appears? Is Leena the one who is actually losing her mind, not Celeste? This is a gloomy, creepy novel that had me guessing incorrectly about what was really going on. It had a surprising twist at the ending, which wasn't satisfying, but was a shock to me. I was completely caught up in Leena's descent into life at Frost House. I've been trying to read Frost for four years. It was worth the wait; I really enjoyed being baffled and spooked by this book.